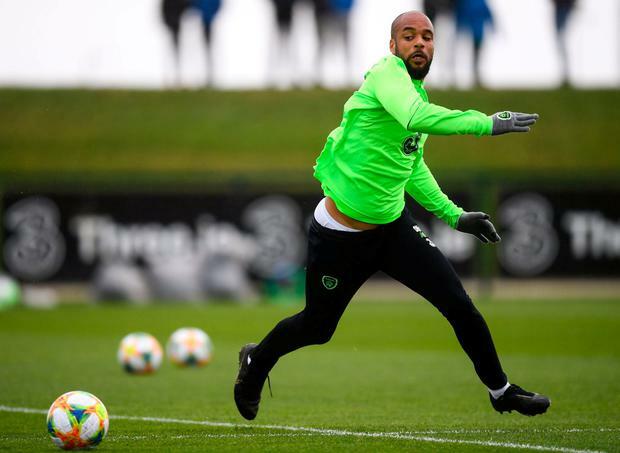 There were many times when David McGoldrick felt he needed a kick in the a**e.
Trouble was, with his luck, he would probably end up on the treatment table, such was his luckless spiralling series of injuries. Such that, when it came to the summer of last year, and a diffident relationship with Ipswich Town had dwindled away into nothing, after 14 years as a professional footballer he was now suddenly a 30-year-old ex-professional footballer. Waiting for the telephone to ring. Waiting for someone to say they wanted him. But why would a club want him to play for them when it so often seemed he couldn't find the desire to play for himself? "I've got kids and a family, I've got bills to pay." Too late to think of that now. For a few weeks, he pitched up at St George's Park, the HQ of the English FA, and benefited from their rehabilitation facilities. Other times, he trained on his own. Or else just sat by the phone. One day it rang. Sheffield United. Was he interested? "I was straight up the M1." It was a gamble from a manager, Chris Wilder, but then this was a manager whose ambitions were as heady as the football his teams like to play. Nine months later, eight games separate Sheffield and McGoldrick from potential automatic promotion to the Premier League. And today he sits before us, restored to Ireland garb after his loss of form and repeated injuries exiled him to the sidelines of Martin O'Neill's thinking. Ironically, O'Neill's successor would play a pivotal role in transforming McGoldrick's moribund career. "When Mick was going to leave at the end of the season he said he would leave it to the next manager," he explains. "So I was waiting because I was kind of open to staying there but the new manager came in and said 'no, not for him'. That was in June so I started to look around. "No-one really wanted to give me a chance so I worked on my fitness and improved myself and got the buzz back just from being... not wanted. "It was a kick up the a**e. This was where I was at. I wasn't a golden player at a team like Ipswich any more. I had to go and prove myself." McCarthy would proffer a glowing character reference to Wilder but he couldn't strap up the player's boots for him. "My form in the last couple of years hasn't been where I wanted it to be and that's why I haven't been playing for my country," he says, strongly refuting the suggestions of a row between himself and O'Neill. "There are players I played with that aren't playing now and they had successful Championship and Premier League careers. "It's hard out there at the minute. Contracts for anyone over 30 aren't free-flowing any more. I'm a humble lad and I have gone on to work hard at Sheffield United." You've to believe in yourself and in your ability so I believed in that. Just wanting to be out there, the positivity was just wanting to show people again that I can still play at this level and that's what I am managing to do now." Initially, he was offered a year deal; 12 goals and several assists in a thrilling campaign doubled the contract length. "I believe I had lost my way a bit. I don't think you realise it until you're in that sort of situation. I maybe got a bit too comfortable at Ipswich, although I loved my time there. "But we were mid-table every week and there was no big expectations to go out there and win every game, like there is at Sheffield United at the moment. "I never wanted to stop playing football. I wanted to be back doing it every day and scoring goals. I want to get promoted with Sheffield United and keep going." He knows now the link between injury and form and tries not to be too hard on himself on wallowing as he once did. The freakish nature with which his body kept failing him must have upset his mind, too. Where to start? A back-heeled goal in training; hamstring, four months. A leap to control a ball; groin, three months. Then he lands on his knee; six weeks. Playing through injury compounded it all. Now he is kinder to his body and his head. He works with the renowned US guru Bill Knowles - Andy Murray is his latest famous patient - and they still regularly mail each other. And now he hopes his club revival can be mirrored on Irish duty. "I'm buzzing to be back. I've had 18 months out watching the boys. It was a bit hard to watch it, I want to be involved. "My aim was to get back in the squad. I've done that now and my aim is to score goals for my country. I think I've found myself again."